Posted by admin in activity reports, Bagana, Barren Island, Batu Tara, Chaitén, Chile, Dukono, eruptions, Fuego, Guatemala, Hawaii, Indian Ocean, Indonesia, Japan, Kamchatka, Kilauea, Mayon, Mexico, Pacaya, Papua New Guinea, Philippines, Popocatépetl, Rabaul, Russia, Sakura-jima, Shiveluch, Slamet, Suwanose-jima, United States. 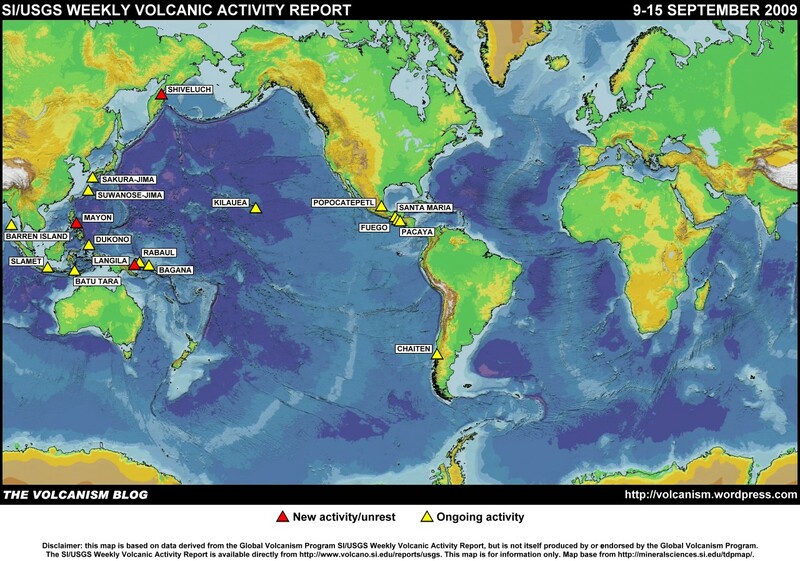 The Smithsonian Institution/United States Geological Survey Weekly Volcanic Activity Report for 9-15 September 2009 is available on the Global Volcanism Program website. The following is a summary and not a substitute for the full report. New activity/unrest: Langila (Papua New Guinea), Mayon (Philippines), Shiveluch (Russia). Ongoing activity: Bagana (Papua New Guinea), Barren Island (India), Batu Tara (Indonesia), Chaitén (Chile), Dukono (Indonesia), Fuego (Guatemala), Kilauea (Hawaii, USA), Pacaya (Guatemala), Popocatépetl (Mexico), Rabaul (Papua New Guinea), Sakura-jima (Japan), Santa María (Guatemala), Slamet (Indonesia), Suwanose-jima (Japan). 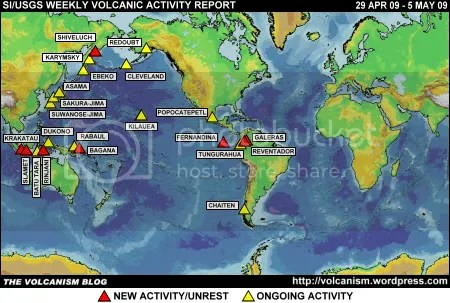 Posted by admin in activity reports, Bagana, Batu Tara, Dukono, eruptions, Hawaii, Ibu, Indonesia, Japan, Kamchatka, Kilauea, Mayon, Papua New Guinea, Philippines, Rabaul, Russia, Sakura-jima, Shiveluch, Slamet, Suwanose-jima, United States, Weekly Volcanic Activity Reports. The Smithsonian Institution/United States Geological Survey Weekly Volcanic Activity Report for 5-11 August 2009 is available on the Global Volcanism Program website. The following is a summary and not a substitute for the full report. New activity: Ibu (Indonesia), Mayon (Philippines). Ongoing Activity: Bagana (Papua New Guinea), Batu Tara (Indonesia), Dukono (Indonesia), Kilauea (Hawaii, USA), Rabaul (Papua New Guinea), Sakura-jima (Japan), Shiveluch (Russia), Slamet (Indonesia), Suwanose-jima (Japan). Posted by admin in activity reports, Alaska, Batu Tara, Chaitén, Chile, Colombia, Dukono, Ecuador, eruptions, Fuego, Galeras, Guatemala, Hawaii, Japan, Kamchatka, Karangetang, Karymsky, Kelut, Kilauea, Llaima, Manam, Mexico, Pacaya, Papua New Guinea, Peru, Popocatépetl, Rabaul, Redoubt, Russia, Sakura-jima, Santa María, Shiveluch, Slamet, Tungurahua, Ubinas, United States, Weekly Volcanic Activity Reports. The Smithsonian Institution/United States Geological Survey Weekly Volcanic Activity Report covering 3-9 June 2009 is available on the Global Volcanism Program website. The following is a summary and not a substitute for the full report. New activity: Galeras (Colombia), Karangetang (Indonesia), Sangeang Api (Indonesia), Slamet (Indonesia). Ongoing activity: Batu Tara (Indonesia), Chaitén (Chile), Dukono (Indonesia), Fuego (Guatemala), Karymsky (Russia), Kelut (Indonesia), Kilauea (USA), Llaima (Chile), Manam (Papua New Guinea), Pacaya (Guatemala), Popocatépetl (Mexico), Rabaul (Papua New Guinea), Redoubt (USA), Sakura-jima (Japan), Santa María (Guatemala), Shiveluch (Russia), Tungurahua (Ecuador), Ubinas (Peru). Posted by admin in activity reports, Bagana, Batu Tara, Caribbean, Chaitén, Chile, Colombia, Dukono, Ecuador, eruptions, Etna, Hawaii, Indonesia, Italy, Japan, Kamchatka, Karangetang, Kilauea, Llaima, Makian, Nevado del Huila, Papua New Guinea, Popocatépetl, Rabaul, Redoubt, Russia, Sakura-jima, Shiveluch, Slamet, Soufrière Hills, Tungurahua, Ubinas, United States. The Smithsonian Institution/United States Geological Survey Weekly Volcanic Activity Report covering 27 May-2 June 2009 is available on the Global Volcanism Program website. The following is a summary and not a substitute for the full report. New activity: Karangetang (Indonesia), Makian (Indonesia), Slamet (Indonesia). Ongoing activity: Bagana (Papua New Guinea), Batu Tara (Indonesia), Chaitén (Chile), Dukono (Indonesia), Etna (Italy), Kilauea (Hawaii, USA), Llaima (Chile), Nevado del Huila (Colombia), Popocatépetl (Mexico), Rabaul (Papua New Guinea), Redoubt (Alaska, USA), Sakura-jima (Japan), Shiveluch (Russia), Soufrière Hills (Montserrat), Tungurahua (Ecuador), Ubinas (Peru). Karangetang (Indonesia). 30-31 May, seismicity increased and tremor was detected. Diffuse white plumes rose 10-50 m and crater incandescence was seen on 30 May, white emissions rose 100 m above Utama Crater on 31 May, incandescent material descended as far as 2.3 m, mostly down S flank. Makian (Indonesia). Seismicity, particularly tremor, increased during 28 May-2 June. Slamet (Indonesia). 27 May, ash plume rose to 4.3 km a.s.l., possible plume rose to 6.1 km. Bagana (Papua New Guinea). 2 June, ash plume to 2.4 km a.s.l., drifted 75 km W.
Batu Tara (Indonesia). 27 May-2 June, ash plumes to 2.4 km a.s.l., drifted 25-75 km NW, W and SW; thermal anomaly detected 29 May. Chaitén (Chile). 20-27 May, gas-and-ash plumes rose 1.5 km from the growing lava dome complex and collapses caused by instable slopes generated block-and-ash flows. Seismicity remained elevated with large hybrid earthquakes at 5-9 km beneath the western part of the dome complex. 28-29 May and 1-2 June, ash plumes rose to 1.8-2.4 km a.s.l. Dukono (Indonesia). 27-28 May, ash plumes to 3 km a.s.l., drifted 55-110 km NE. Etna (Italy). 25-31 May, the NW-SE-trending fissure E of the summit craters continued to produce active lava flows, There was degassing from the Northeast Crater, the NW and SE Bocca Nuova vents, from the E flank of the Southeast Crater and at summit fumarolic fields. Kilauea (Hawaii, USA). 27 May-2 June, lava continued to flow SE through lava tubes to the Waikupanaha ocean entry and (until 31 May) the Kupapa’u ocean entry. Active surface lava flows were also detected on 30 May. The Halema’uma’u crater vent continued to produce a mainly white plume with an occasional brown tinge, that drifted mainly SW. A molten lava pool near the base of the cavity produced varying incandescence. Llaima (Chile). A 2-square-kilometre area of elevated temperatures was observed on the E flank during an overflight on 1 June. Small areas of gas emission, a small cone in formation about 800 m below the crater and a 300-metre-long E-W-trending fissure 200 m from the rim of the main crater, emitting brown ash and steam plumes, were also observed. There were weak fumaroles at the summit crater. Nevado del Huila (Colombia). A seismic swarm took place on 28 May that included magnitude 4 and 4.8 earthquakes. On 31 May an episode of tremor occurred associated with an ash emission, and a further pulse of tremor was detected on 2 June. Popocatépetl (Mexico). 27 May-2 June, emissions of steam and gas observed, with slight amounts of ash during 27-29 May. Rabaul (Papua New Guinea). 21-28 May, white and occasionally blue plumes from Tavurvur cone rose 1 km above the crater and incandescence from the summit crater was observed at night. Redoubt (Alaska, USA). Seismicity remained low but above background 27 May-2 June. Lava dome growth continued. Sakura-jima (Japan). An explosion on 30 May produced a plume to 4.6 km a.s.l. that drifted SE. On 31 May an ash plume rose to 3 km a.s.l., and on 1 June eruptions produced plumes to 2.1-3.4 km a.s.l, some of which drifted S.
Shiveluch (Russia). Seismic activity was above background levels 22-29 May; steam-and-gas emissions were observed 21-23 May, and plumes with small amounts of ash rose to 4 km a.s.l. on 22 May. A daily thermal anomaly was detected over the lava dome. Soufrière Hills (Montserrat). Activity during 22-29 May was at a low level: a possible small explosion followed by a rockfall occurred on 23 May, and a small pyroclastic flow descended 1 km E on 24 May, producing an ash plume that drifted W.
Tungurahua (Ecuador). Strombolian activity was observed at night during 26-28 May, followed by nocturnal incandescence at the crater until 1 June. On 27-29 and 31 May thermal anomalies were detected. There was the usual range of noises: explosions, cannonades and roars. Steam-and-ash plumes rose to 7 km a.s.l. and drifted W and SW on 28 May, and ashfall was reported 28-30 May. Ubinas (Peru). On 29 and 31 May eruptions produced ash plumes to 5.5-6.7 km a.s.l. that drifted NE and SW. A bluish gas plume with some ash content was reported on 1 June, and gas-and-ash plumes rose 0.9-1.5 km a.s.l. and drifted SE following an explosion on 2 June. The foregoing is a summary of the Smithsonian Institution/United States Geological Survey Weekly Volcanic Activity Report covering 27 May-2 June 2009. It is provided for information only, and is based on but not a substitute for the full report, which comes with its own criteria and disclaimers. for the full report, which comes with its own criteria and disclaimers. The map base is derived from the Smithsonian Institution/USGS/US Naval Research Laboratory This Dynamic Planet website. Posted by admin in activity reports, Alaska, Barren Island, Batu Tara, Caribbean, Chaitén, Chile, Colima, Dukono, Ebeko, Ecuador, eruptions, Fuego, Guatemala, Hawaii, India, Indonesia, Japan, Kamchatka, Karangetang, Kilauea, Llaima, Mexico, Papua New Guinea, Peru, Rabaul, Redoubt, Reventador, Russia, Sakura-jima, Shiveluch, Slamet, Soufrière Hills, Suwanose-jima, Tungurahua, Ubinas, United States, Veniaminof, Weekly Volcanic Activity Reports. 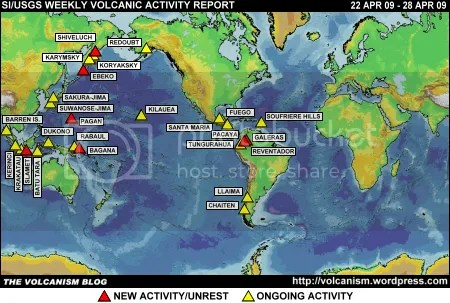 The Smithsonian Institution/United States Geological Survey Weekly Volcanic Activity Report covering 20-26 May 2009 is available on the Global Volcanism Program website. The following is a summary and not a substitute for the full report. 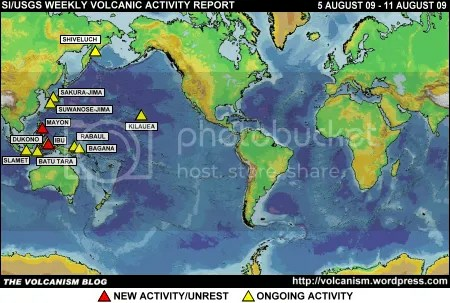 Ongoing activity: Barren Island (India), Batu Tara (Indonesia), Chaitén (Chile), Colima (Mexico), Dukono (Indonesia), Ebeko (Russia), Fuego (Guatemala), Kilauea (Hawaii, USA), Llaima (Chile), Rabaul (Papua New Guinea), Redoubt (Alaska, USA), Sakura-jima (Japan), Shiveluch (Russia), Soufrière Hills (Montserrat), Suwanose-jima (Japan), Tungurahua (Ecuador), Ubinas (Peru), Veniaminof (Alaska, USA). Posted by admin in activity reports, eruptions, Indonesia, Slamet. Slamet volcano in central Java is continuing to increase its eruptive activity, according to reports in the Indonesian press. The area being affected by Slamet’s ash is widening, with ashfall reported in parts of Purbalingga regency, 50 kilometres to the south-east. The head of the volcano observation division of the Volcanology and Geological Disaster Mitigation Center (PVMBG), Agus Budianto, is quoted as reporting that ‘The lava sprays are also increasing. We therefore call on local residents to stay alert’. Officials are recommending that local residents wear masks to protect themselves from the ash, but say that the alert level for Slamet remains at the second-highest level of Orange (Siaga) and that no evacuations are necessary. Reports earlier this week spoke of Slamet producing frequent bursts of ash and erupting lava 600 metres above the summit. There has been criticism of the regional governments around Slamet for responding too slowly to the increased activity at the volcano and failing to keep people informed: ‘villagers living near Mount Slamet have not been informed about what to do if an eruption occurs’. Posted by admin in activity reports, Indonesia, Paluweh, Slamet. To the ongoing concerns about activity at Kerinci and Krakatau, must be added new alerts for Slamet, Java’s second-highest volcano and one of its most active, and Paluweh (also known as Rokatenda) in the Lesser Sunda Islands, which last erupted in 1985. The Volcanology and Geological Disaster Mitigation Center (PVMBG) has raised the alert levels for both volcanoes from the lowest level of Normal to the next highest level of Yellow (Indonesian: Waspada). Local news reports speak of a higher frequency of earthquakes at Paluweh, 23 per day up from an average of 2 per day in early April, while Slamet has apparently doubled its normal daily earthquake rate to 97 per day, a white plume has been rising to 300 metres above the crater, and water temperatures have risen. Three volcanoes are currently on the second-highest alert level of Orange (Siaga) in Indonesia: Semeru, Karangetang and Ibu. Thirteen – including, now, Slamet and Paluweh (Rokatenda), are at Yellow (Waspada).